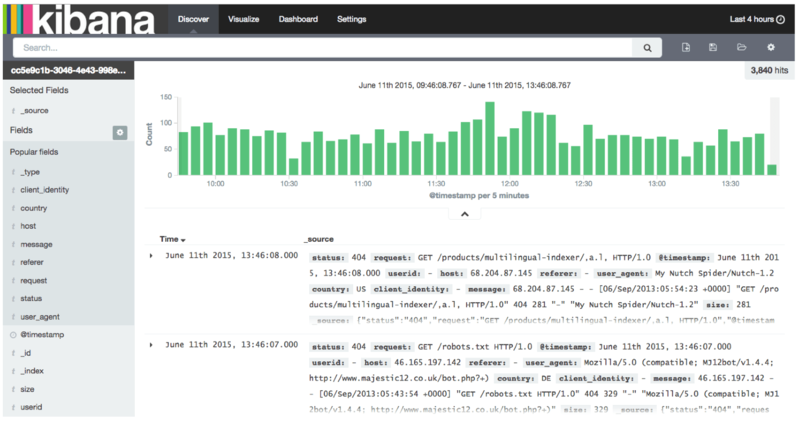 We just pushed a new release of Logsene to production, including 1-Click Access to Kibana 4! Anomaly detection and Alerts for logs or any indexed data! Let’s take a look to the Kibana 4 integration. You’ll find the “Kibana 4” button in the Logsene App Overview. Simply click on it and Kibana 4 will load the data from your Logsene App. Kibana 4 automatically shows the “Discover” view and doesn’t require any setup – Logsene does everything for you! This means you can immediately start to build Queries, Visualizations, and Dashboards! Simple Demo Dashboard – try it here! If you prefer to run Kibana and point it to Logsene, yes, you can still do that; we show how to do that in How to use Kibana 4 with Logsene. If you don’t want to run and manage your own Elasticsearch cluster but would like to use Kibana for log and data analysis, then give Logsene a quick try by registering here – we do all the backend heavy lifting so you can focus on what you want to get out of your data and not on infrastructure. There’s no commitment and no credit card required. And, if you are a young startup, a small or non-profit organization, or an educational institution, ask us for a discount (see special pricing)! Is the source code to these logsene modifications public? If not, any plans to release it? It sounds like it’s building on community contributions. Sandy, these changes are not changes to Kibana itself. These additional functionalities are a part of Logsene – https://sematext.com/logsene as well as SPM – https://sematext.com/spm . We simply integrated Kibana with Logsene so people can slice and dice their data (logs or other types of events) in Logsene, without having to run their own Elasticsearch clusters.